I always thought centerpieces are the best way to really just shout the theme of the wedding to all your guests. 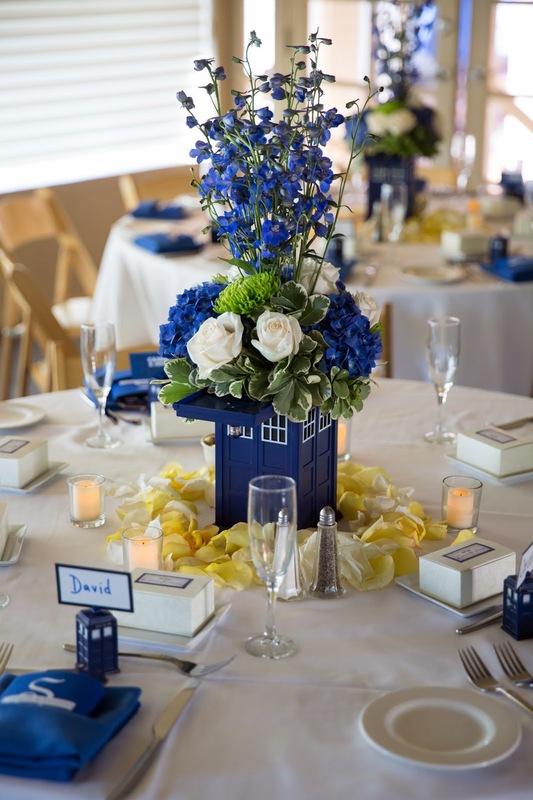 The choice of flowers are really nice and give the centerpiece some height and the colors match the Tardis nicely. The seat assignments (name placeholders) are also really cute! Amazon has a Tardis Cookie Jar which looks like it has plenty of space for flowers. As for the seat assignments, it looks like these are little Tardis keychains, also available on Amazon. Planning a Doctor Who wedding? So am I! Here's a collection of my favorite dresses, decorations, cakes, and other whovian ideas. Welcome and I hope you get a little bit of Doctor Who inspiration for your wedding! For your fingers and toes! This color is "Mesmerize" by Essie.